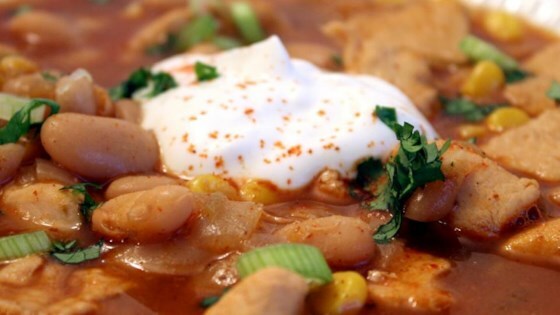 "I love a hearty beef chili as much as the next guy, but once in a while there's nothing wrong with going over to the light side and enjoying an equally comforting bowl of white bean and chicken chili." Heat 1 teaspoon vegetable oil in a large, deep skillet over medium-high heat. Add chicken breasts and cook until browned, about 4 minutes. Reduce heat to medium, flip breasts, cover the pan, and cook until browned on the other side, about 5 minutes. Remove to a plate and allow to cool before chopping into cubes. Return skillet to medium heat, add 1 teaspoon vegetable oil, onion, salt, and black pepper. Cook and stir until onion turns translucent, 4 to 5 minutes. Stir in garlic and cook until fragrant, about 1 minute. Stir ancho chili powder, cumin, flour, chipotle pepper powder, and oregano into the onion mixture; cook and stir for 2 to 3 minutes. Add 1 cup of the chicken broth and stir, scraping up any brown bits off the bottom of the pan. Stir in cornmeal and bring to a simmer. Stir in beans and 1 more cup chicken broth. Cut cooled chicken breasts into cubes, add to the chili and bring to a simmer. Add remaining cup of chicken broth, season with salt, black pepper, sugar, and cayenne pepper to taste; cook until heated through. Serve garnished with green onions, sour cream, and cilantro. A flavorful chili that’s a little lighter with less fat. This was fantastic! Absolutely delicious, I loved it! Need I say more? I was worried because I don't like chipolte, but this definitely worked well together. So light and yummy! So good! I wouldn't change a thing.